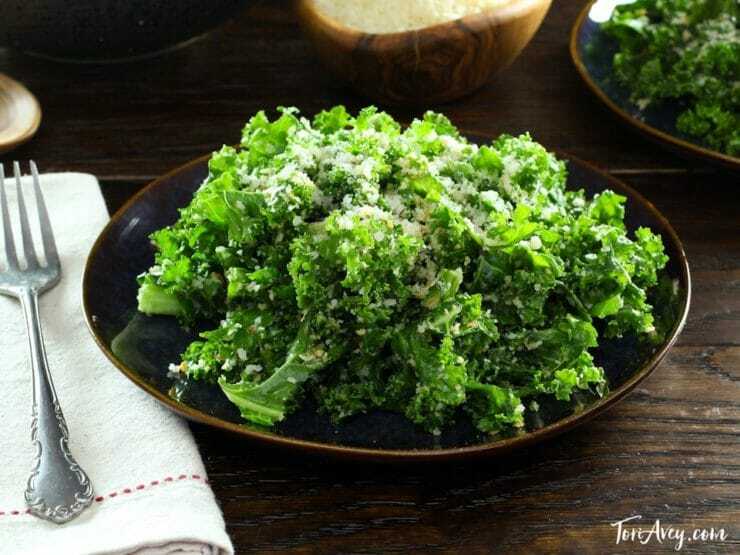 This irresistible kale salad is always a favorite with family and friends. Topped with a creamy, zesty garlic dressing and toasted panko breadcrumbs, every mouthful is full of flavor. Not a kale fan? 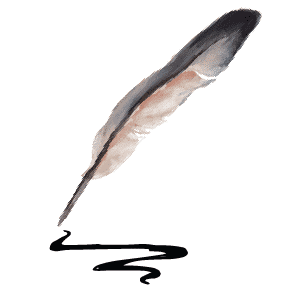 Read on– the secret is the massage! For a while I considered calling this the “Best Thing That Happened To Me This Week” salad. The first time I served it to my husband, he mumbled those words between elated mouthfuls. 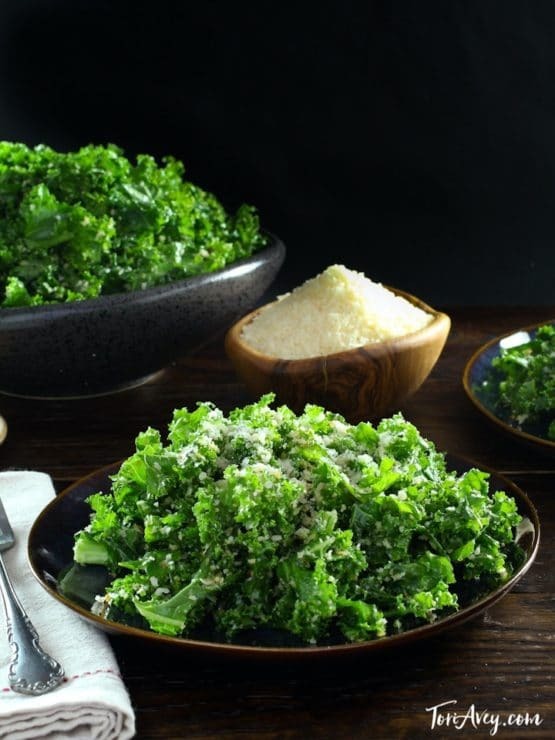 Yes, this salad has the power to induce major feelings of euphoria… kale! The thing I once despised, then learned to massage, then grew to love. Can you imagine? 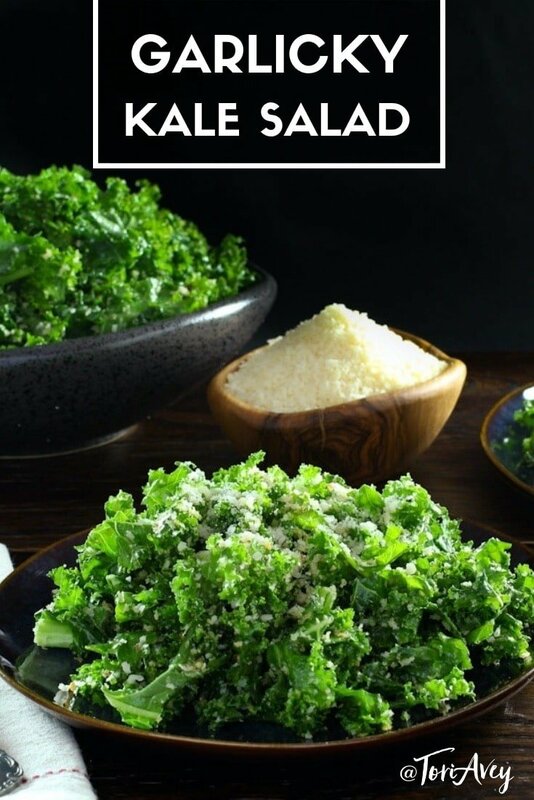 In this Garlicky Kale Parmesan and Panko Salad, massaged kale salad is topped with a creamy roasted garlic dressing and Parmesan cheese. Large unwieldy croutons are replaced by delicate, crispy toasted panko and crushed red pepper flakes. I massage the kale with the dressing, then toss it with the toasted panko, chili flakes and Parmesan. The resulting salad has a Caesar-ish flavor with a bit of a spicy kick. It’s heavenly. Kale is one of the healthiest foods on the planet. It’s a cruciferous leafy green packed with Vitamins A, B6, C, and K along with magnesium, potassium, iron, copper, manganese and phosphorus. It also contains strong phytonutrients and cancer-fighting antioxidants. 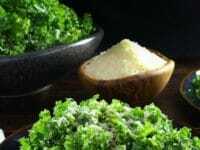 The fiber in kale helps to lower blood cholesterol levels. Eating kale regularly can lower your risk of cancer and heart disease. It’s fabulous stuff, especially when prepared like this. I am addicted to this salad. Serve it at a party and prepare to be asked for the recipe over and over and over again! 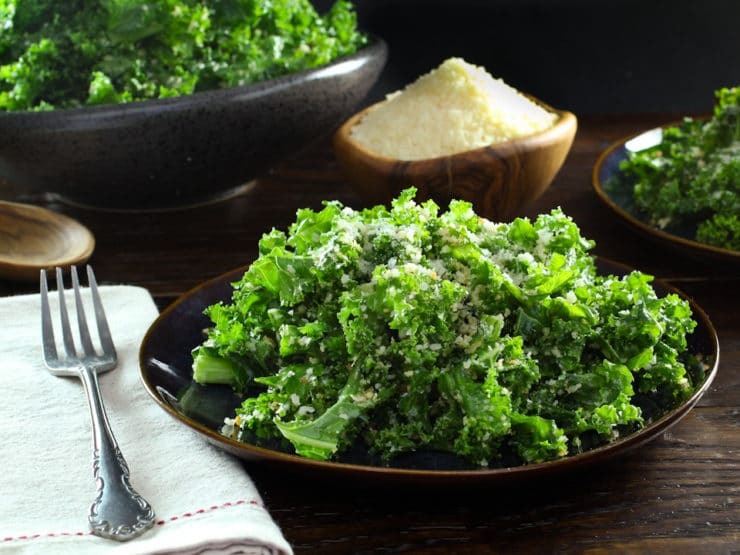 If kale isn't your favorite, try adding garlic and cheese. They make everything better! To make gluten free, leave out the breadcrumbs or sub GF panko, and make sure your packaged products are certified GF. 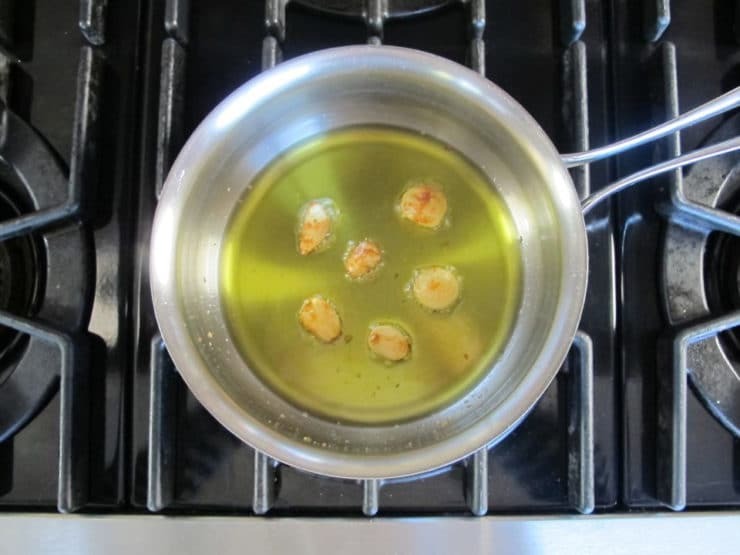 In a small saucepan, combine 1/3 cup of olive oil with the garlic cloves. Cook over low heat, stirring occasionally to prevent burning, until the garlic turns light golden brown and roasted, about 15 minutes. Carefully remove garlic from heat. The oil will be very hot. Once the oil has cooled to room temperature, remove and reserve the garlic cloves. 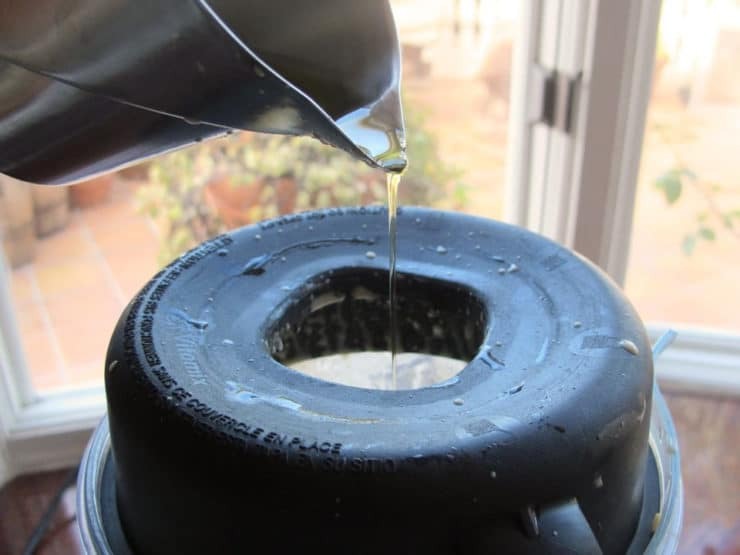 Keep the garlic-infused oil, you'll need it soon. In a blender combine roasted garlic cloves, mayonnaise, lemon juice, water, 1 tbsp parmesan, Dijon mustard, Worcestershire sauce, salt, pepper and Tabasco. Blend until smooth and well combined. Turn the blender to medium and very slowly drizzle in the roasted garlic oil through the opening in the top. Do not pour it in all at once or it will not emulsify and you will have a broken dressing. Remove the lid and scrape down the sides with a rubber spatula. Replace the lid and blend on high once more. The finished dressing should be smooth and well combined with no streaks of oil. 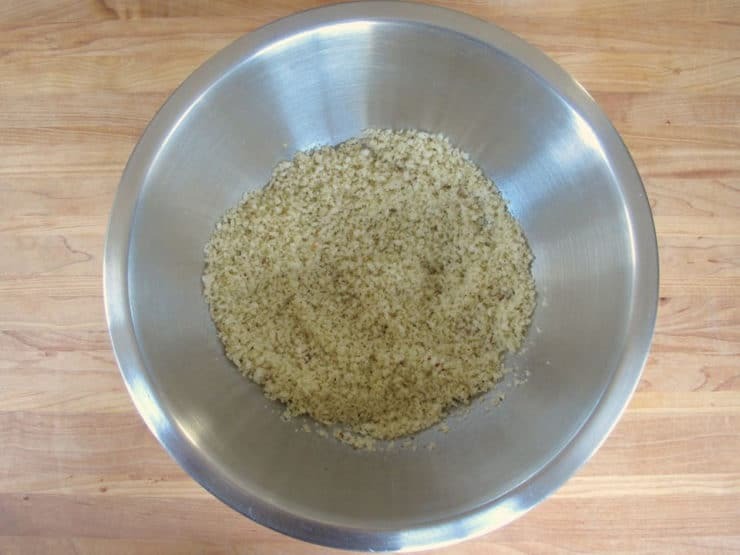 In a small mixing bowl combine panko breadcrumbs, 1 tbsp olive oil and crushed red pepper flakes. Toss to combine. 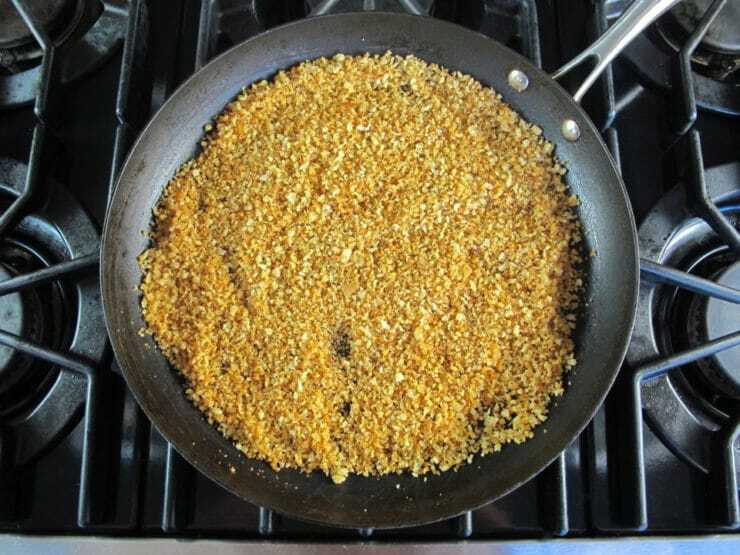 Transfer the breadcrumb mixture to a frying pan and cook over medium heat until the breadcrumbs are toasted golden brown, stirring often to prevent burning. Immediately remove the breadcrumbs from the pan and set aside. 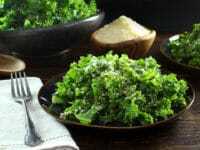 Place chopped kale into a large mixing bowl or salad bowl. Pour the roasted garlic dressing over the kale, then massage the kale for 3-4 minutes until kale is wilted and well coated with dressing. Add breadcrumbs and 1/4 cup of parmesan to the salad and toss to combine. Serve. This was a lot of work for salad but worth it. Really delicious. Thanks! I love this salad and I’m thinking of making it for Passover. Do you think I can substitute the Panko breadcrumbs with matzo farfel? If so, any specific suggestions on how work with the matzo? Thank you! I love this salad too 🙂 I’ve never made it for Passover. Matzo farfel would probably work, just make sure you toast it with the pepper flakes and only add it just before serving so it doesn’t get mushy. Or, you can just omit the breadcrumbs– the salad works great without them, too. Wow!! Absolutely delicious. My new favorite salad recipe. Thank you so much for sharing it! I made this tonight and it was absolutely delicious! My only suggestion would be to not put the whole dressing on the kale leaves as I did find there was a tad too much. When making this for a dinner party, how far ahead can you make it? Or how much of it can you do ahead and then finish at the last minute. I would hate to be in the kitchen massaging kale with guests waiting for dinner. Carol, you may make the dressing up to a day ahead– that is the most time consuming part of the process. 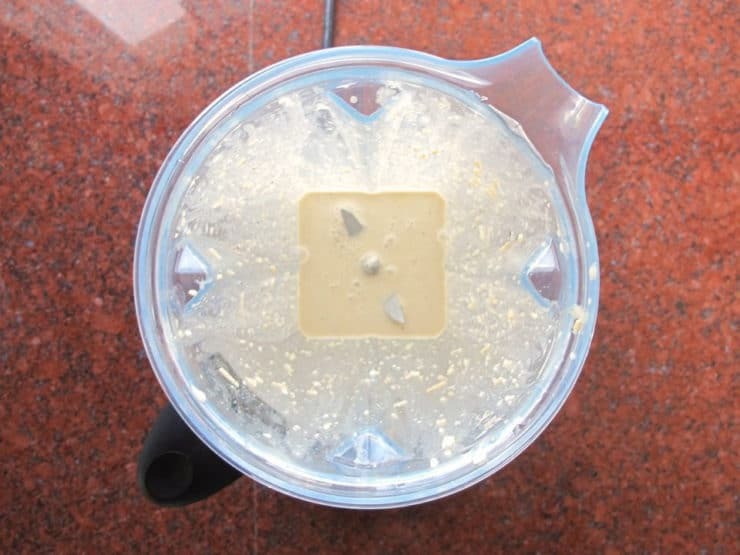 If you make it properly (slowly drizzle oil into the blender to emulsify) it will stay thick and won’t separate in the fridge. You can also toast the breadcrumbs ahead. 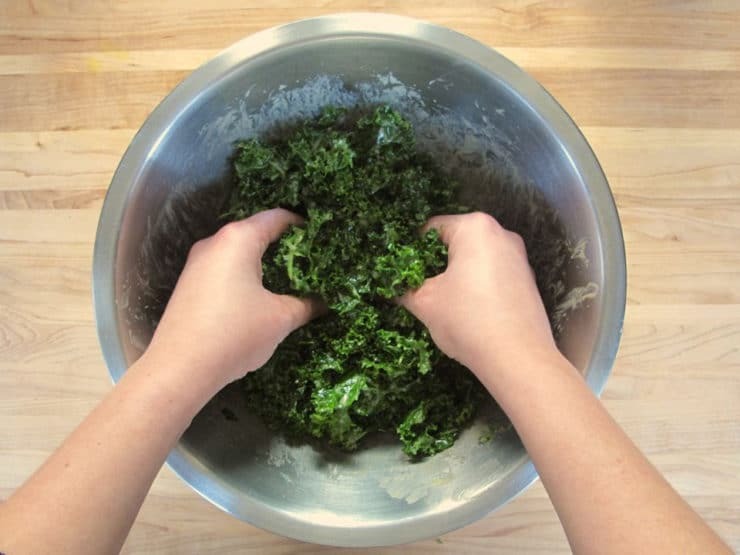 Massage the kale that morning without dressing until it is wilted and sweet-tasting, and keep it in the refrigerator. Toss everything together just before serving. Enjoy! Right?? It’s so addicting. It’s become a regular on my menu when I host dinner parties, friends always ask me to make it… even the ones who formerly “hated” kale! One of my favorite ways to eat kale! i will make this weeekend!!! This sounds awesome. I made *(& massaged) a kale salad with shredded brussels sprouts just the other day. I used what I call a basic dressing (oil, cider vinegar, fresh crushed garlic, dry mustard, Worcestershire, oregano, Hungarian paprika) that’s been in the family forever. I took a little of that and added the juice of 1/2 naval orange, and added some of Trader Joe’s Sweet & Spicy pecans. Love the idea of the panko breadcrumbs. This looks wonderful. Must try tonight.. Thank you for not only the recipes, but the detailed descriptions step by step & the history of the holidays. You’re welcome Marilyn, enjoy the salad… it’s truly one of our family favorites! I just made this last night. It was delicious! My family and I loved it! I used Ian’s gluten free original style panko breadcrumbs and they were great. We will make this again and again! Thank you, Tori. Great Sheryl! I have taken to making a batch of this dressing almost every week, we love it so much. This was delicious! I might just be a kale convert after this recipe! Hi Nicole! I’m so pleased you enjoyed it (and funny, I had za’atar roasted chicken last night for dinner as well!). I love it when people share my blog with others, but I ask that the recipes be shared as links to my site rather than reproducing the entire recipe on your own site. I am always happy for link mentions, and I really love it when people share their own picture of one of my recipes, then link back to my site for the recipe… that way I get a pingback, so I can check out how yours turned out! Of course, I’ll link, that’s why asked. For me it is a perfect recipe (where you could get such a great garlicky-Caesar hand-massage, I might open a SPA, interested?) and I normally change a lot, there is no way adapting it and anyway why rewrite it. The photo is a bit difficult – we ate the lot and completely forgot. Next time. There will be quite a lot of kale salad experiments here and I hope most of them will be as good as this. N.
I just had to say that this recipe was absolutely delicious!! My entire family gobbled it up – my three kids (5, 8 and 11, and the 8-year old is normally really picky! ), plus my husband who usually does not care for kale. I am sending this recipe to my friends – everyone should try it! So yummy!! Great Leigh! I recently brought it to a friend’s house for a potluck and her son said it’s his favorite salad ever. I was very pleased, as he’s only 8 or 9 years old– the fact that he loved a kale salad says something! I need to do dairy-free. Is there a suggested substitution for the parmesan? Thanks a lot! Beth you could try subbing 1 tbsp of mayo for the parmesan in the dressing and omitting the parmesan in the salad, however I personally think the parmesan flavor really makes this recipe… here’s hoping it turns out tasty! Tori, I do not like kale EXCEPT in this recipe! It is terrific! I have made it twice, and I’ve loved it each time. Hi Tori, have been using your recipes ever since I discovered your Passover suggestions. Favorites have included pumpkin challah, brussel sprouts with pomegranates. Had to write to say this kale recipe completely lives up to your description! Everyone loved it and went for seconds. Thanks for the fantastic inspiration. With thanks to my mom who served kale in our house from the day I was born in 1949! Will be making this salad. My caesar dressing is supe simple and a twist on the recipe from Gourmet Cookbook. 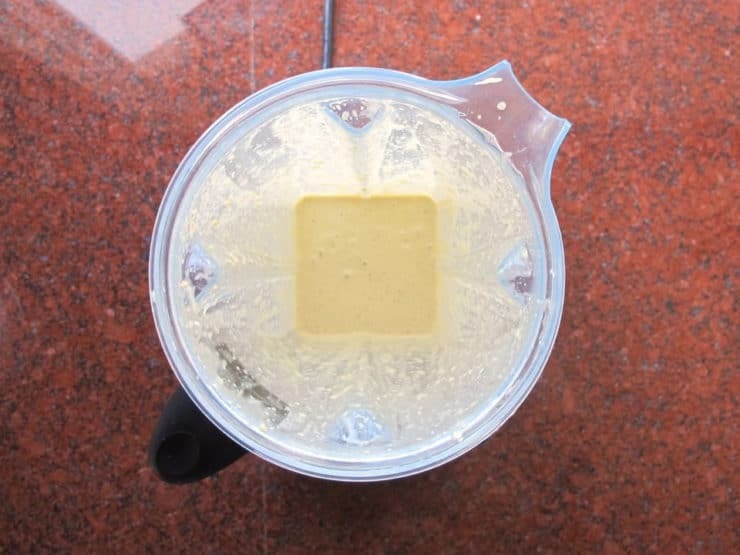 1 tablespoon lemon juice; blend while streaming 9 tablespoons of olive oil through the opening in the lid of the blender. Can I use a food processor instead of a blender (I don’t have a blender)?? Hi Linda, a food processor should work fine. Enjoy! I think I mentioned once before that you. are. evil. You owe me a replacement keyboard. This one has shorted out from repeated torrents of drool. I just had two servings and I want to go back for a third. I love the crunch of the panko and the salt from the cheese. For those freaked out about the mayo, a little of this dressing goes a long way so you won’t taste the mayo, promise. Tori this is so so so delicious and different- a big hit with lasagna for tonight’s dinner!! Thank you for sharing. I used reduced fat mayo and it was still fab! Awesome Rebecca, I’m so glad you liked it! The mayo is kind of freaking me out, and I don’t eat fish. Any suggestions for subbing? Diana the mayo is there for creaminess and to help emulsify the dressing. It doesn’t give an overly-mayo taste to the dressing, if that’s what you’re concerned about. If you’re worried about cholesterol, you can sub vegannaise. You can also sub a vegetarian Worcestershire sauce if you prefer, there are a few on the market. I substituted regular mayo with wasabi mayo (since its lower in saturated fat) and took out the tabasco and it was great. Garlicky kale is the best! I’ve been making this since discovering it on a trip to Calgary this summer. I use my own Caesar dressing, though, which includes anchovy paste. It goes together quickly and tastes wonderful! Patricia, recipe please for your caesar dressing? Why this sudden fascination with Kale? All of a sudden it is the “must have” green! Just like Panko….who decides to push them above all other ingredients? Not picking on you Tori…just curious. I can’t wait to try this salad!! I love anything kale. I even got my husband to try it sautéed and he agreed it was “ok”. How does it hold up? As in leftovers. I know in most houses there wouldn’t be any, but knowing 1 person living in my house, there might be a serving or two leftover. Is it too wilty the next day? It will last a day or two in the fridge Renee, however I would add the Parmesan and Panko to each individual serving rather than to the whole salad so they don’t get soggy/clumpy (keep the Parmesan in the dressing though). Store the panko and Parmesan in separate zipper bags and add them just before serving. Enjoy! Sounds delicious! For me, though, I think it’ll wait until the weather warms up. All I want to eat right now is hot soup. Mmmmmm! Yes please! Sounds amazing. I LOVE Kale! YUM. I wish I had that for lunch today! I usually make kale “chips” but I can’t wait to give this recipe a try!